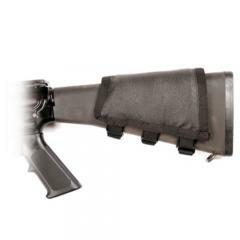 The AR15 Cheek Pad from Blackhawk! is a quick, effective and economic way to improve the shooting comfort of AR15 and M16 style rifles. The pad features a closed cell, high-density foam core that provides a comfortable resting place for the face. Three removable foam pieces allow users to easily adjust the height and thickness of the pad and deliver the perfect level of support. A non-slip, HawkTex® exterior provides added stability in wet, rainy or icy conditions. The convenient upgrade is ideal for use with raised optics, such as scoped sights, because it allows the shooter to comfortably raise their eye level to match that of their sight. This eliminates distorted sight pictures and results in greater shooting accuracy.